Do you enjoy the freedom your mobility scooter gives you, but don’t want to be limited to only using it on dry, sunny days? It may be time to consider an easy-to-fit cover, which offers protection in any weather conditions. You might have been put off buying a scooter cover, because you think it will be difficult to store and fit when you want to use it. Modern canopies are actually very well-designed, so that they can be easily folded and unfolded in just a few seconds, to give you the protection you want. A scooter offers independence, but not if it can’t be used in all weathers. With a scooter cover, you won’t need to plan your trip in advance, as it is easily stored behind the seat in a fitted bag. It is then unfolded, to form a canopy on the top and sides of the scooter. It is easily secured to the front of the scooter with straps and Velcro pads. Once the roof canopy is in place, the sides are pulled out and zipped from back to front. If the sun decides to show its face, the cover can be quickly folded back in place at the back of the scooter, with the aid of colour-coded Velcro pads which make it easy to fold in the correct way. You won’t even need to have your cover specially made, as many fit most types of scooter and fit instantly, with one size fitting both the smallest scooters and the largest ones. The lightweight frame and compact design mean you can store your scooter in the usual way, and it can also be used on car-transportable models. Innovative designs mean you get protection from the rain and the sun, and these covers are built to last from durable material. 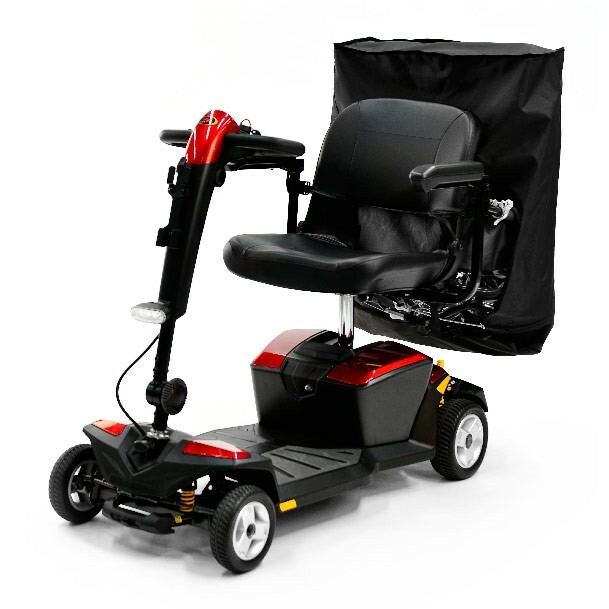 If your scooter is stored outside, a folding canopy, which has a lightweight frame, is also ideal for protecting it from the elements and to prevent rust. A motorised scooter is a big investment and one you’ll want to look after by preventing damage from rain, dust and heat. Light plastic covers are available for covering your scooter when not in use, but these are not as effective, as they can blow away in high winds and are likely to rip. They are also unlikely to be completely weather-resistant. To keep your scooter running reliably, it needs to be kept free of large amounts of dirt and dust, and of course, it must be kept dry. With a framed canopy, you have the bonus of having both a protective cover for the scooter when not in use, and a means of keep yourself dry when out and about in the unpredictable British weather. With the benefit of protecting both the scooter, and you as driver, from the elements, a canopy is a very worthwhile investment to ensure you enjoy your freedom and independence any time you want. Limitless Pill – Is it Really a Miracle Brain Booster?